Try them barbecued! They will even blacken like a "real" hot dog too. Yummy!! To be very honest I have eaten the regular meat dog and the Morning Star Veggie Dog and the Morning Star Dog tasted better in every possible way to me. No weird taste what so ever, and the texture, color, and everything about it was absolutely perfect. It even made two other devout meat eaters ask for more, and they hate everything else vegan. They too agreed it was better than the meat dogs they had been accustom to. 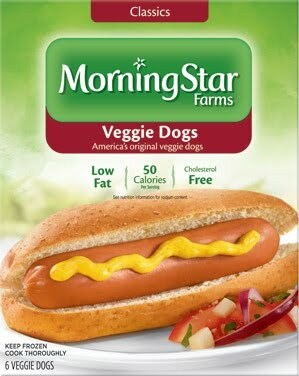 I, being vegan myself was delighted to hear their praises of Morning Star's dogs. Haven't ate one yet,but gonna try them! Worst, they contain soy beans, and, with the second two main ingratiate being surge, (corn syrup solids and wheat gluten), I would skip this company’s products, and you should be smart about what you put into your body, too. Find a company that cares more about your life than it does about making money from misleading you. 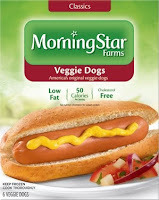 An interesting note to mark is whether the egg whites used in Morningstar Veggie Dogs are from range-free hens or cruelty and careless farmers. My belief is, if Morningstar, Inc. do not say, they are hiding a lot of truth about their products; keep away! Who says they are gluten free? They definitely have gluten in them. I am a meat eater. My daughter turned me onto these yesterday, Memorial Day. I ate them on a bun and added grilled onions, horseradish mustard, ketchup and topped with some vegetarian baked beans. I have to admit I enjoyed them quite a bit. But then I picked up the package, my biggest complaint was too much hydrogenated ingredients. I'm interested in pursuing other brands of veggie product that I like the flavor as much as I did this one but with higher-quality ingredients.